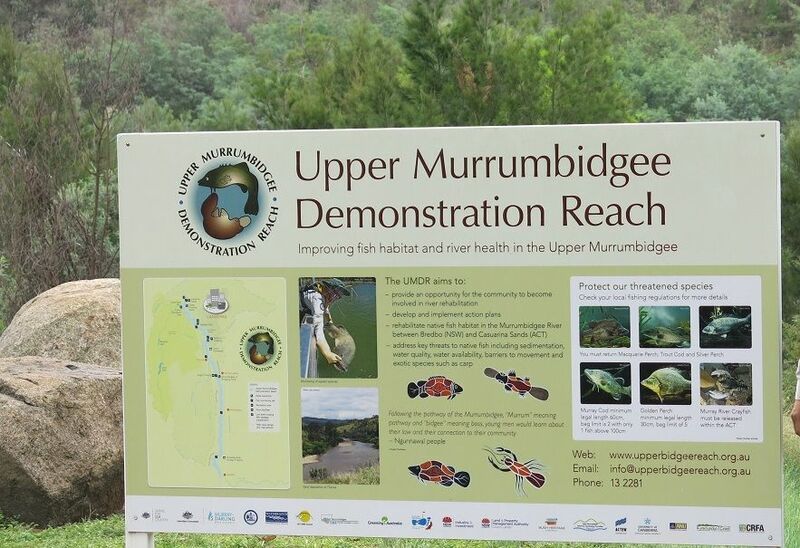 Established in 2009, the Upper Murrumbidgee Demonstration Reach (UMDR) is the youngest of the seven in the Basin but has steadily been gaining momentum in the region. Acknowledging that rivers and fish do not recognise linear boundaries, the UMDR was established to span 100 km over two jurisdictions between Bredbo (NSW) and Casuarina Sands (ACT). The reach is a collaborative partnership between Kosciuszko 2 Coast, Bushland Heritage Australia, ACT Government, the Murray-Darling Basin Authority, South-east Local Land Services, NSW Department of Primary Industries, and local communities. The Upper Murrumbidgee River is a highly modified catchment, with a history of aquatic and riparian habitat loss due to land use practices. In many areas of the catchment, this has led to a highly degraded river and a significantly altered native fish community. Historic clearing of riparian vegetation, invasion by pest plant and fish species, erosion and sedimentation, smothering of in-stream habitat, barriers to fish passage and significant water diversions at Tantangara Dam have drastically changed hydrology and sediment transport capacity of the reach. Despite this degradation, the Upper Murrumbidgee River is valued as a significant riverine ecosystem containing the critical habitats for several nationally listed threatened species, including Trout Cod, Murray Cod and Macquarie Perch. The UMDR also contains large tracts of intact riparian vegetation primarily located throughout the spectacular bedrock confined gorges. The UMDR also forms part of a larger 400 kilometer stretch of the Upper Murrumbidgee River listed on the Register of the National Estate (due to the presence of Trout Cod and critical habitat to support the species). Widespread erosion caused by land clearing in the late 1800’s to 1900’s has caused a build-up of sand in the Murrumbidgee River. In some areas, such as Tharwa, the sand build-up has caused the depth of water in the river channel to become very shallow which prevents fish moving up and down stream and provides little habitat as there are no in-stream rocks, or fallen trees. The impact of these areas on fish is even greater during droughts. Studies of the Murray-Darling Basin have shown that native fish populations are currently at or below 10% of pre-Eurpoean settlement levels. The Tharwa region of the Murrumbidgee has been identified as one of the areas where fish habitat could be improved. the use of boulder structures has been shown to have a less consistent beneficial effect than woody debris. collect information on carp spawning and aggregation sightings via an online portal and mobile phone app. hold a regional carp muster in conjunction with local fishing groups on the Australia Day long weekend in January 2015. You can register your interest for or help to sponsor this event by emailing the UMDR facilitator below. The NSW DPI Habitat Action Grant program has funded the UMDR to control emergent instream willows along 45km of the upper Murrumbidgee River, in the NSW section of the reach (Bredbo to Angle Crossing). The project involves teams of volunteers paddling the river and controlling willows along the way during autumn and spring/summer 2014. Canoe teams will be escorted by trained and experienced river guides. Community engagement of key stakeholder groups is an ongoing activity within the UMDR. Strong relationships have been formed with local fishing groups, schools, landholders and community NRM groups and many field days and demonstrations have been held such as the Murrumbidgee CMAs recent Willow control workshop. Despite a huge environmental awareness in the region, there’s not necessarily a huge commitment to action however UMDR partners are working to improve adoption and increase participation. Fish in the UMDR are monitored through the reach at least on a biannual basis and recently annually. Recent monitoring has detected a range expansion of Murray Cod and natural recruitment of the endangered Trout Cod. 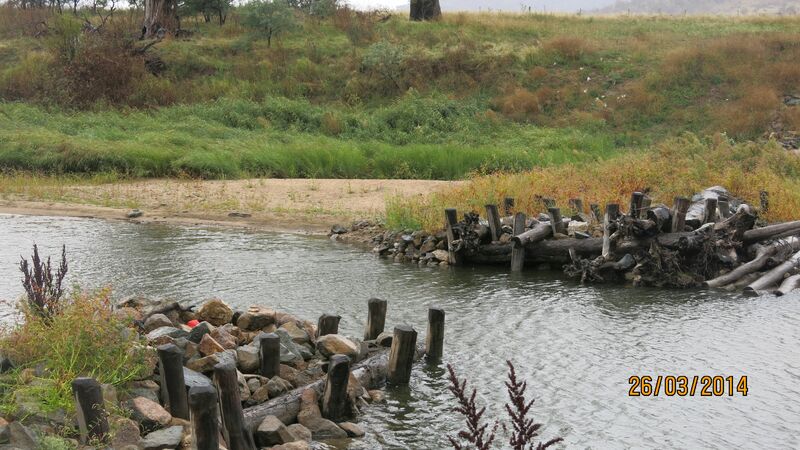 Fish will also be monitored in the vicinity of the ELJ project before and several years after the installation to determine whether the structures have a beneficial effect on the fish population. Community monitoring activities including Waterwatch and riparian condition will also be carried out as part of the Tharwa Fish Habitat Project.